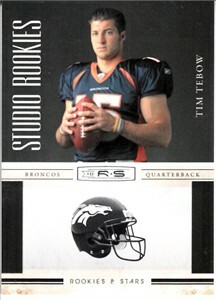 Tim Tebow Denver Broncos 2010 Panini Rookies & Stars Studio Rookie Card of the former Heisman Trophy winning quarterback (#1). NrMt-Mt or better. ONLY ONE AVAILABLE FOR SALE.